Guarded and angry at humanity, Kass has nowhere to go for the next three weeks. She recoils from Eli's gentle patience, while accepting his not-quite invitation to join their band tour. He gets her, though, and he is the only person to ever make it past her cutting back talk. But she’s a life-hardened punk who won't get along with the rest of the band. He’s a sensitive guitar player. Sparks will fly as they try to meet in the middle on their rock and roll road trip. 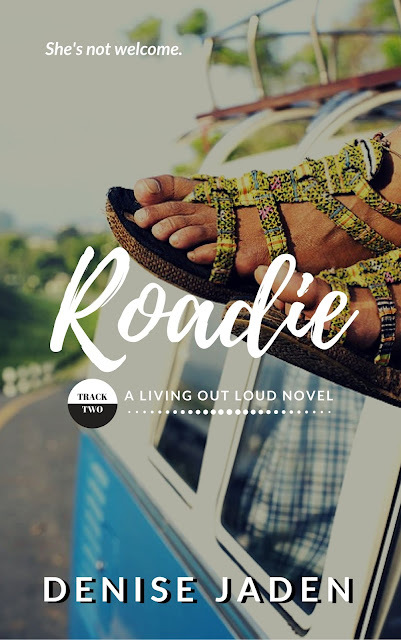 Roadie, Track Two in a new upper YA Series, features page-turning band drama, sizzling romance, and nuanced characters. If you like Rainbow Rowell and Gayle Forman, you’ll love Denise Jaden’s new series. Buy Roadie today and hit the road with some unforgettable characters. Denise Jaden’s novels have been shortlisted or received awards through the Romance Writers of America, Inspy, and SCBWI. The first draft of her debut novel, Losing Faith, was written in 21 days during NaNoWriMo 2007 and she loves talking with writers and students alike about her Just-Get-To-The-End fast-drafting process. Jaden’s other young adult novels include Never Enough, Foreign Exchange, A Christmas Kerril, and Avalanche. Her non-fiction books for writers include, Writing with a Heavy Heart, Fast Fiction, and Story Sparks. In her spare time, she homeschools her son, acts with the Vancouver film industry, and dances with a Polynesian dance troupe. Find out more at denisejaden.com.